Since 1977, Retlaw Industries has been manufacturing custom thermoplastic OEM parts. But since our humble beginnings in a small garage, we’ve also been building quality customer relationships, which is our top concern. Retlaw Industries has a unique philosophy: We focus on people rather than things – the people throughout the world we are proud to call customers. Our team strives to go beyond the norm in innovation and cost effectiveness when designing and manufacturing custom products and proprietary Belt, Cable, and Rope management systems. We understand each customer has specific needs and applications for their products. From conception through completion, Retlaw Industries’ various departments will assist you through product development, engineering, tooling and manufacturing. Because we understand our customers' needs, we know what kind of solutions they will require. Our goal is to do whatever it takes to provide the customer injection mold tooling and molded and assembled plastic parts shipped domestically or internationally. The plastic manufacturers at Retlaw have decades of experience in thermoplastic engineering and injection molding. Over the years, we’ve produced long runs of precise plastic components for use in a huge variety of applications and industries. Our facility houses over 19 different molding presses, designers, machinists, assemblers and quality control specialists, meaning we are a complete injection molding service who caters to your exact industry needs. We are the injection molding specialists you must have for all your plastic products. Our designers use the latest in CAD programs, 3D prototyping and testing programs to help you create whatever precise plastic part you require. After the design has been properly tested, it’s off to our machinists who use wire and sinker EDM machines in conjunction with modern CNC machines and controllers to create precision molds. Our wide range of molding presses are next up, producing the accurate molded plastic components you require. 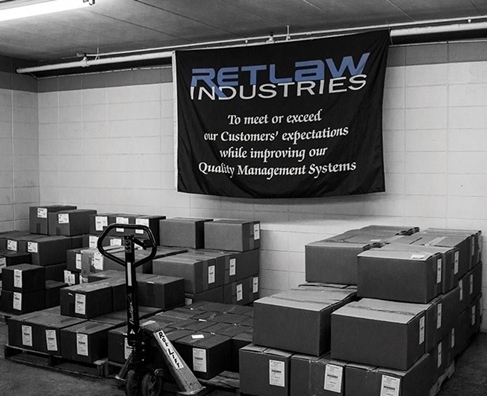 If needed, Retlaw’s specialists will assemble your order, eliminating the need for outsourcing any part of the process. Our certified quality controllers then use high accuracy equipment to ensure your product operates precisely as designed. Retlaw is an all-in-one injection molding company, and we are always ready to tackle your next plastic part project. Contact Retlaw Industries today for quality custom thermoplastic OEM parts.